The Buono Family Curse? The name may mean "good angel," but the headlines tell a different story. The grandson of the Hillside Strangler committed a murder suicide in Yorba Linda, California a few days ago. His victim: his own grandmother -- once the wife of the Hillside Strangler. The Orange County Register carried the story, and CBS 2 carried photos and details. Photo: the late Christopher Buono above; Angelo Buono below. See The BBC Case Closed Library or Wikipedia for a rundown of grandpa's 1970s crime spree with his cousin Kenneth Bianchi, which included ten murders. The apples don't fall far from the trees in the Devil's orchard. BTK 'Souvenir Hunters' Warned The mayor of Park City does not cotton to strangers picking apart Rader's house. Crime Scene Photos as Art? The Dutch seem to think they're worth hanging in a gallery. My opinion? 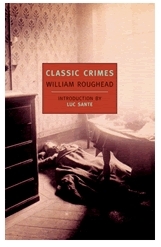 I think the cover art of Classic Crimes by William Roughead (whom Dorothy Sayers called "the best showman who ever stood before the door of the chamber of horrors") speaks for me. The photo has a title: Murder of Madame Leprince, 119 Rue Saint-Denis, March 6, 1898. I've long been intrigued by this photo but the story behind it eludes me. Ah, well, another of life's little mysteries. I agree it's an awesome cover, and I too was intrigued. I Googled "Madame Leprince" and only came up with dozens of links about the author of fairy tales. Probably not the same woman!